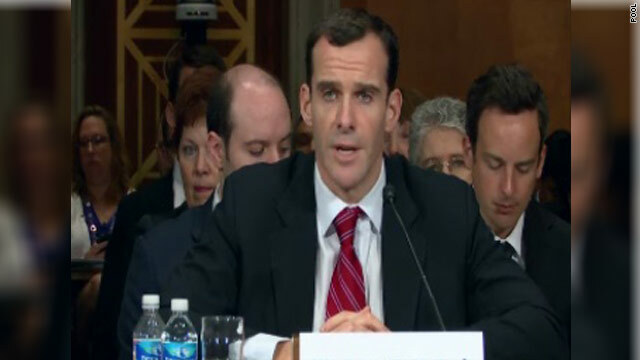 Brett McGurk testified before the Senate on Thursday. Washington (CNN) - The wife of Brett McGurk, the president's pick to be ambassador to Iraq, whose nomination is in jeopardy following recent revelations of questionable conduct, said Friday she feels "targeted" over recent reports that led to her resignation as a reporter for the Wall Street Journal. "I've never felt so vulnerable, so targeted and so exposed as I have in the last two weeks," Gina Chon wrote in an email to friends, obtained by CNN. "I feel like I have become collateral damage in this process." McGurk, who served in the administrations of Presidents Barack Obama and George W. Bush, has come under scrutiny since salacious emails with Chon were made public, revealing the two carried on an affair while they were stationed in Baghdad in 2008. They later married, but the emails and ensuing revelations led to Chon's resignation from her post Tuesday at the Journal and Senate leaders have indicated they may delay a vote on McGurk's confirmation. Although Chon took responsibility for those that were hurt by her actions, she said the emails "reflected flirtations banter and nothing more." "People have jumped to unfair and inaccurate conclusions using our own words against us," Chon wrote. "Yet, nobody knows what we meant, what was in our heads, or in our hearts, better than we do." The emails in question were sent in 2008, when McGurk was in Baghdad working on delicate negotiations with Iraqis over a potential status of forces agreement, which Chon covered for the newspaper. A June 20, 2008 email chain posted online between the two shows Chon comparing reporters seeking a scoop to vultures. McGurk replied: "If treated to many glasses of wine – you could be the chosen vultures." Another email showed McGurk telling Chon, in part, "I had a very good day with the Iraqis – the best yet. Can't tell you about it of course. But you should definitely stay past Sunday." Her reply: "Stop being such a tease!" At one point in the chain, when referencing plans, Chon wrote "… if I could really come tonight (not in the briefcase), I could cut out early …"
Chon addressed that line in Friday's note, saying "I have to wonder, do people really think I get my stories by asking sources if I can hide in their briefcase?" Some other emails were perhaps too graphic to include. The emails have led some members of Congress to question McGurk's judgment. Six Republican members of the Senate Foreign Relations Committee sent a letter Wednesday urging President Barack Obama to pull the nomination. The senators said the "release of information detailing unprofessional conduct demonstrates poor judgment and will affect the nominee's credibility" in Iraq. Democrats hold a 10-9 majority on the committee and may decide to postpone a scheduled committee vote on the nomination next Tuesday. In McGurk's defense, Chon said he never "gave me sensitive or classified information nor did he trade his knowledge for my affection." "Brett always turned to public service and went back to Iraq every time he was called," Chon wrote in Friday's email. "Even now when people are saying horrible things about me and him, he still wants to serve. We've both had to tell our crying moms not to look at the news." - CNN's Ted Barrett and Paul Courson contributed to this report. I think Barack Obama is STILL the president, not a former president. Unless I've been in a coma and missed an election. Oh puh-lease. Ms. Chon doth protest too much. The fact is that she signed on for this when getting involved with Mr. McGurk. They started their relationship when he, in his capacity as a high-level national security official, was engaged in sensitive negotiations with a foreign government. It is not clear if he actually shared confidential information with Ms. Chon, a reporter at the time, but certainly there was a suggestion that he may have. And her ethics are questionable as well. I don't have any sympathy for either one of them. I also tend to believe that Ms. Chon's former employer, the Wall Street Journal, told her that if she didn't resign, she would be fired. It was the "ex-wife" who suffered "collateral damage" done by her then husband and his mistress Ms. Chon. So go cry on somebody elses shoulder. Ignore them President Obama – They are once again trying to make SOMETHING out of NOTHING when they should be creating JOBS!!!! Remember the moron governor from SC – Oh how he was praised because he cheated on his wife and the Republicans did not see fit to get him out of office............Pah-Leeeeeezzzzzeee!!! …of former Presidents Barack Obama… CNN, are you joining the "one term crowd" now? Getting a little "foxy" there! Our congress has wasted so much time investigating nothing. No wonder they don't have time (3 days out of every 3 weeks) to vote for jobs bills. Poor things. Just worn out. I don't understand why McGurk was considered a trustworthy security advisor to President Bush but now it's Republicans who want the nomination withdrawn over some e-mails. Seems like there are some missing pieces in this story.